Spotting wildlife in Big Sky is quite common. Due to our location in the Greater Yellowstone Ecosystem, we share our mountain town and backyard with some of the most majestic creatures in the world. One of those animals is the mighty moose. Do you know what to do if you encounter a moose in their natural habitat? Moose are big animals that like to roam around Big Sky. 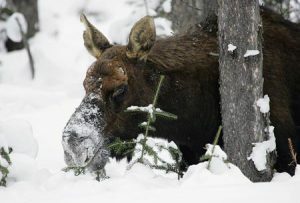 It's not uncommon to spot a moose sleeping or eating twigs in your backyard, while playing golf in the meadow, while hiking on your favorite trail, or during your daily dog walk. 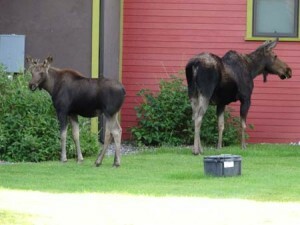 Humans and moose share the same neighborhoods and playgrounds. Moose safety needs to be a top priority in the event that you encounter a moose while you're out and about. Moose aren't afraid of humans. They aren't going to bolt when you wander into their area. Don't let this give you a false sense of security. While moose may seem docile and friendly, they can also be quite ornery and aggressive. 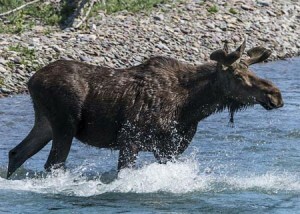 Moose attacks are rare, but they are always a possibility if the moose feels threatened. In the unfortunate situation where a moose feels threatened, they are either going to get out of the area or they will attack. In an attack they will often bluff charge first. If they do make contact they will kick with their hooves and trample you - a situation you never want to be a part of! If you notice any of these warning signs, it's time to get out of there ASAP. In the rare event that a moose comes at you or charges you, run away and quickly find a safe spot. (Note that this is the opposite of what you do if a bear attacks.) Try to hide behind a tree, fence, rock, or building. If that's not an option, curl up and protect your neck and head. Stay in that position until the moose leaves the area. A scary moose encounter is rare, but it is a possibility. When you're in Big Sky country, you need to have a basic understanding of moose safety. Now you know what to do if you encounter a moose in Big Sky, Montana. Be safe!